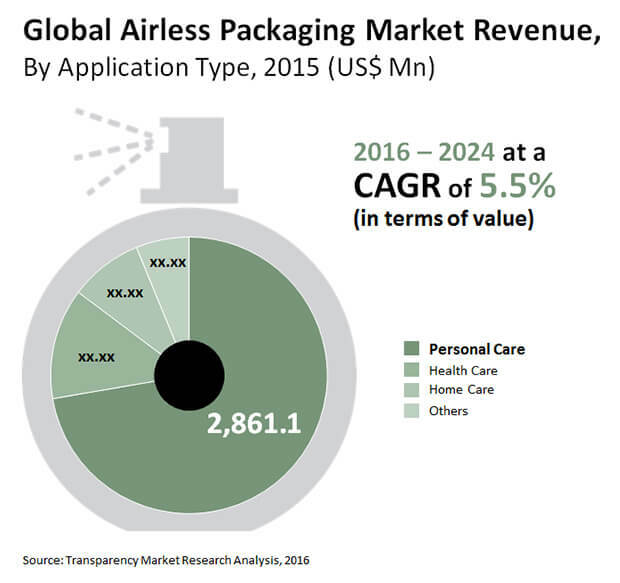 The global airless packaging market is experiencing intense competition on account of the presence of a number of players, states Transparency Market Research (TMR) in its latest research report. There is cutthroat competition between the leading players such as HCP Packaging, LUMSON SPA, Westrock, and Aptar Group Inc. Most of the players currently are setting their eyes upon expanding their business in Europe, as this region holds promising growth opportunities. According to TMR, the global airlines packaging market is anticipated to expand at a steady pace and reach an evaluation of US$6.34 bn by 2024. On the basis of geography, is expected that Europe will emerge is the most promising regional market. Europe is currently the leading regional market as well on account of the stupendous efforts taken by market players on the research and development of improved products. The European regional market for airless packaging will expand at a 5.1% CAGR between 2016 and 2024. The demand from North America is also expected to be healthy. Asia Pacific is also anticipated to register a high growth rate in the years to come. On the basis of type of packaging, plastic is expected to witness higher demand as compared to glass airless packaging. The demand for plastic airless packaging is higher than glass as plastics make ceiling of contains extremely hassle free and this is especially true for the food and beverage products. The elasticity of plastics is one of the key reasons behind their higher adoption. In addition to this plastic boosts longevity of products. Airless packaging solutions, offer a type of packaging and dispensing system which leverages on the difference in the environment pressure so as to build a vacuum which can help in the releasing of a product when the valve is opened. Airless packaging such as jars, tubes, and bottles are becoming increasingly popular across the cosmetics and food and beverage sectors. The growing demand for airless packaging is also due to the fact that it helps keeping products with sensitive formulations, intact. Airless packaging is becoming popular as it brings about zero wastage. With airless packaging such as comp, it is possible to access 95% of the content which is extremely high as compared to Conventional pumps. Moreover, the freshness and efficacy of a product is maintained on account of airless packaging. The personal care industry and cosmetic industry out of the Forefront of using airless packaging. Cosmetic and personal care companies such as Nivea, L' Oreal, Oriflame, and Olay are making extensive use of airless packaging. However, there is very little scope of product differentiation and this is limiting the growth of the global areas packaging market.